In this two book series, Ken Boa, a best-selling author, speaker and teacher, shares the transforming power of scripture and prayer as a daily reading. 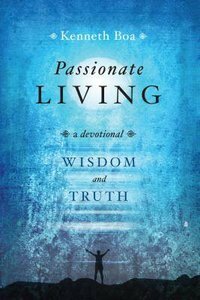 Passionate Living: Wisdom and Truth encourages readers to experience the power of God's Word combined with prayer. This compilation of inspirational thoughts, scripture and prayers will help direct our steps in what God's wisdom is for our life and in what God holds true for our life. About "Passionate Living: Wisdom and Truth"